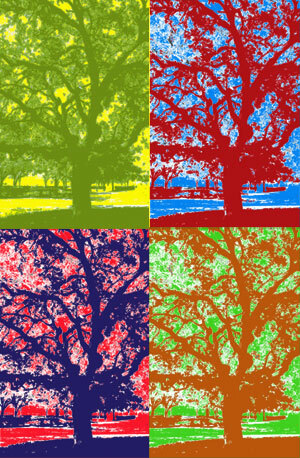 The Rice campus is well known for its lush canopy of trees, but did you know one of the trees is here because of Andy Warhol? The staff of Continuing Studies has long enjoyed the beauty of our "Warhol Tree" that sits directly in front of the building and casts a wide and leafy shadow over our entryway. 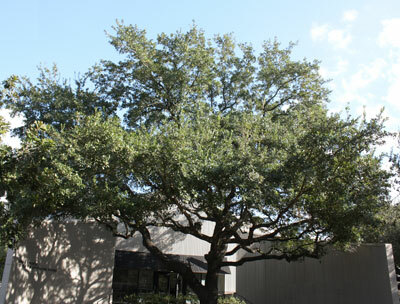 In 1987 Continuing Studies moved into the building just inside Entrance 8 at University Boulevard and Stockton that once housed the Institute for the Arts (now the Department of Visual and Dramatic Arts) that had been founded by Houston art patrons John and Dominique de Menil. The building was the site of many notable art exhibitions in the '70s and '80s organized by the Menils, including "Raid the Icebox 1 with Andy Warhol" in 1970. In the late '80s Mrs. Menil visited Mary McIntire, dean of Continuing Studies, to inquire about a Continuing Studies program one of her friends was interested in taking. Dr. McIntire showed her around the building, which had changed quite drastically to accommodate offices and classrooms. "When we were through with the tour, we went out on the front deck and stood beneath a live oak tree just beyond the decking, and she talked about how the tree came to be planted there from the Warhol exhibition," McIntire says. "The idea of the exhibition was to create the look of an exhibition that was just about to be installed. Paintings were propped up against walls, with the effect of an installation in progress. Part of that idea was the placement of a small live oak, still in its burlap covering, in an open hole in front of the building. It sat askew. She mentioned that every day she would go out to water the little tree in the hope that it would survive the exhibition," McIntire says. "At the end of the show, she planted the tree. It survived and flourished. Since that day on the front deck, we have called it the Warhol Tree." So, many thanks to Andy Warhol and especially Dominique de Menil! Feel free to stop by and enjoy our tree.